You tired of seeing shorts and tees yet? Well I hope not because that’s what I’ve got for you again today. Far from being bored myself, I actually keep coming up with more and more tee ideas! Which is good because what I get done this week composes a good deal of Oliver’s spring/summer wardrobe. 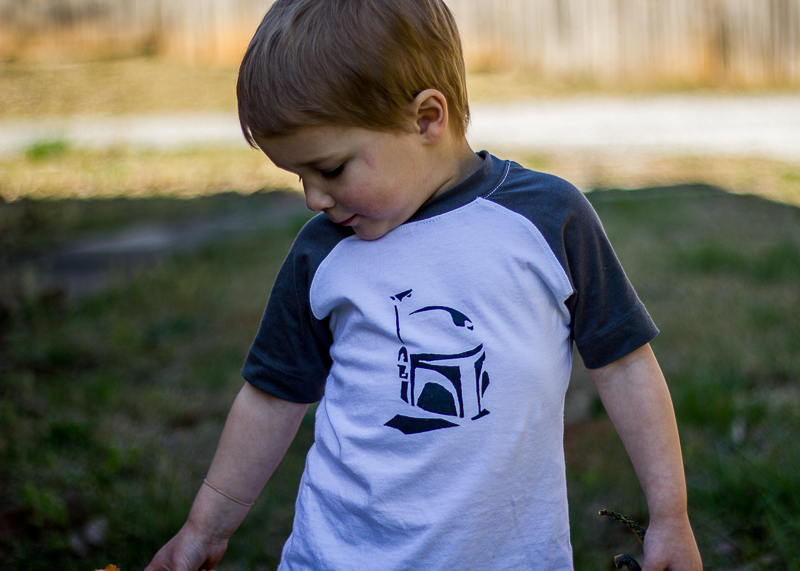 For the tee, I used the raw-edged raglan in a size 4/5 from Sewing for Boys again. I like the pattern pieces of this tee, but, as a side note, I follow a lot of the instructions of the Flashback tee in the construction of this shirt. After this week I think I will be able to sew tees in my sleep! 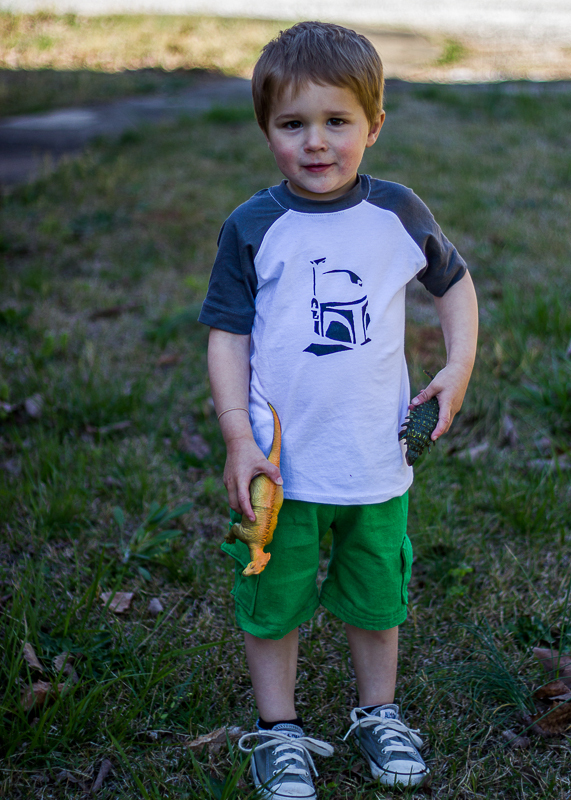 Oliver has two long-sleeve Star Wars shirts and would be happy to wear one or the other every day, so in planning his summer shirts, I knew that I would need at least one Star Wars one. Boba Fett happens to be my little brother’s favorite character so he was an easy choice (Oliver loves to be like Uncle Alex). My second time freezer paper stenciling was even easier than the first! This could get addicting. LOL. The white fabric is a jersey knit from Hobby Lobby of all places. They actually sell 100% cotton jersey, and I was really happy with it in my maternity tee last year, so I got some more to try out with Oliver. The sleeve fabric is from an upcycled tee- yay for using existing hems! The shorts are my third pair of Dana’s Kid Shorts this week. This time I used some green denim I found in the remnant bin at Joann. There was a 1/2 yard bundle, and it was exactly what I needed to make these shorts. Flat front/elastic back again. I wanted to make some cargo pockets so I took the box pleat pocket piece from Rae’s Parsley pants pattern and sewed it to the bottom of the shorts. The denim was thicker than I had anticipated, so it was a bit tricky sewing all those layers of pleats in the pockets, but I’m really happy with how they turned out. 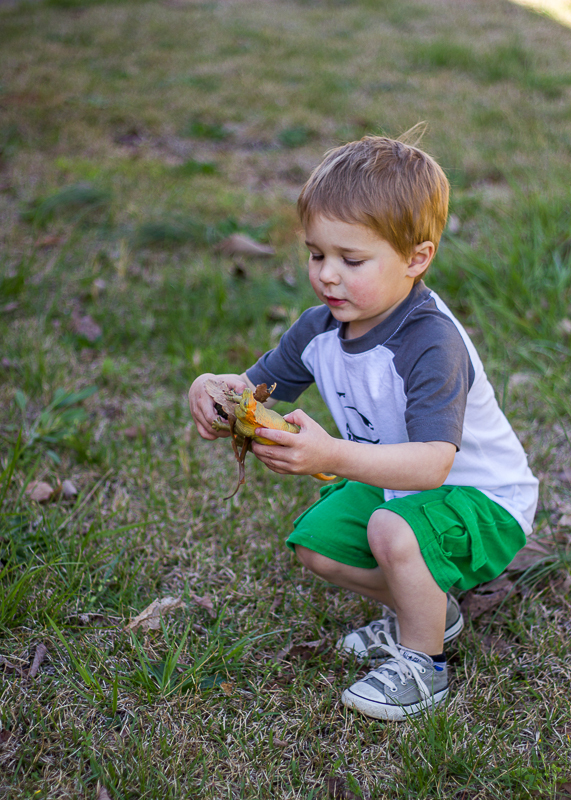 Oliver is at the age where he loves pockets, and it’s fun to give him some to put his treasures in. So that’s it for day 4. I have a fun photoshoot planned for tomorrow afternoon for my mini-me entry. If all goes well, you’ll get to see both boys and their daddy in some pictures. Fingers crossed for good naps and happy pictures! What about you? How is your list going this week? Are you burnt out yet from sewing like crazy? I’m trying to pace myself so I’m not an exhausted, cranky mess by Sunday night! Oh and by the way, yesterday’s outfit is featured on the KCW blog today so go check it out and see all the other cool boy outfits she rounded up! 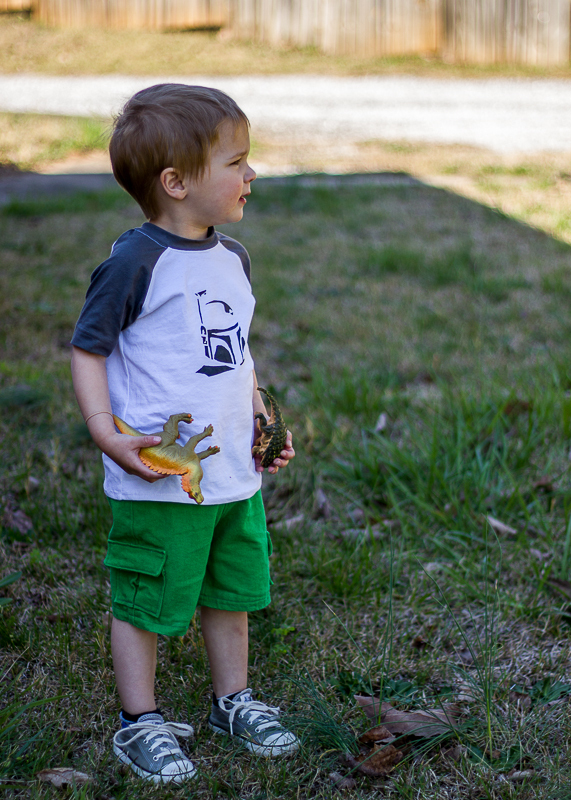 This entry was posted in Kid sewing and tagged dana made it patterns, kid shorts made, made by rae patterns, raw edge raglan, sewing for boys, star wars tee by oliver's fancy. Bookmark the permalink. I can not believe you have two boys, time for your husband, and get SO much sewing done? CARGO pockets???? You are amazing, and SEW inspiring! Why thanks. You are too kind. And seriously, you should see the state of my house right now. I spend time on the fun stuff and get way far behind on things like laundry and cleaning! I love all these staples you’ve been sewing Brooke! By the way – how is your poor finger? Thanks- theyre not super fancy but they are practical- and easy to make multiples of! Also thanks for asking. It’s not too bad. Hurts but I wrapped it up really well this afternoon and I think I’ll leave it on for the next day or so. Kinda afraid to see what happens when I take it off! So mad at myself for that clumsy moment!